The world-renowned biologist Dr. E.O. Wilson received the honor of having a new species of antbird named after him in recognition of his lifetime contribution to scientific discovery and conservation. The world-renowned biologist Dr. E.O. Wilson received the honor of having a new species of antbird named after him in recognition of his lifetime contribution to scientific discovery and conservation. Dr. Wilson is a myrmecologist, an entomologist who studies ants, and is known as the “father of biodiversity” for being the first scientist to publish the term in 1988. The new antbird species named after him, Myrmoderus eowilsoni, will be described in the scientific journal The Auk this week. “The idea of [having] a bird named after you is right up there with maybe the Nobel [Prize], because it’s such a rarity to have a true new species discovered, and I do take it as a great personal honor,” said Dr. Wilson. Myrmoderus eowilsoni was discovered in northern Peru by Josh Beck during a 2016 birding expedition. 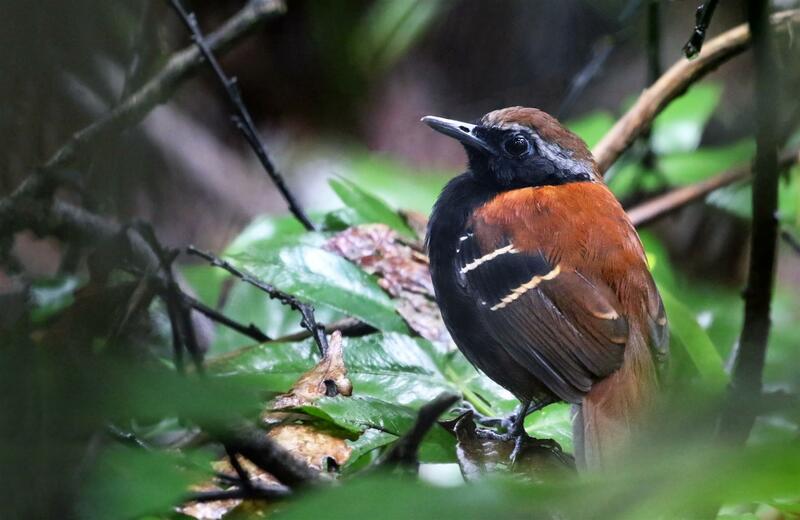 As the main author of the description co-written by a team of scientists, Beck decided to name the new antbird species in honor of Dr. Wilson after discussing the possibility with Rainforest Trust President and distinguished ornithologist Dr. Robert Ridgely. “As Dr. Wilson and I were discussing the possibility of his joining Rainforest Trust’s Board of Directors, it occurred to me that he didn’t have anything other than several ant species named after him,” said Dr. Ridgely. “This for a pre-eminent scientist so highly regarded for his insights on biodiversity! Josh and I agreed this was the perfect, and long overdue, opportunity to name a vertebrate species after him. Even better, it was an antbird!" Although officially retired, Dr. Wilson remains very active in the conservation sector. He is Professor Emeritus and Honorary Curator in Entomology at Harvard University and this fall joined the Board of Directors of Rainforest Trust. Rainforest Trust is a leading international conservation organization that has been steadfast in its mission for 30 years to save endangered species through the purchase and protection of imperiled tropical habitats in partnership with local partners and communities. Since its founding in 1988, Rainforest Trust has helped protect 18 million acres of rainforest and other tropical habitats in more than 125 project sites around the world. Presently, Rainforest Trust is working to establish a network of over 190 protected areas toward its goal of strategically protecting 50 million acres by 2020. Rainforest Trust has a 4-star rating from Charity Navigator, and 100 percent of project gifts directly fund vital conservation action. Rainforest Trust President Dr. Robert Ridgely and Dr. E.O. Wilson. Photo by Rainforest Trust. The newly discovered antbird, Myrmoderus eowilsoni. Photo by Andrew Spencer. Rainforest Trust CEO Dr. Paul Salaman and Dr. E.O. Wilson. Photo by Rainforest Trust.